The 1st Bn The East Surrey Regiment was on the move again in November 1923, this time to Hong Kong. The Battalion, plus the families, embarked for the longest journey it had undertaken since the commencement of their post-war foreign tours. HMT Derbyshire was waiting for them at Port Sudan. The ship, old but comfortable, provided good food. The ship was coal burning, so called in at Colombo and Singapore for coaling. This was a very dirty business, with the coolies and the officers and crew all mucking in to bring the bags on their backs up the ship's side, and then to return empty and do it again. Hence the evacuation of the passengers while this was taking place. It also meant that sightseeing could take place. The troops were tickled at their first sight of rickshaws in Singapore. On their return, the ship was shipshape and ready to sail. There was a threat of a typhoon in the China Seas, but, it came to nothing. Life was enjoyable on this slow boat to China; there was plenty of leisure,sport (chiefly Tug o'War) and, as the records say, 'sunlit idleness, 40 winks and uninterrupted bliss!'. As the Battalion sailed into the harbour, they saw their new abode. It looked like a large tree covered mountain sticking out of the sea with odd houses dotted here and there on the side of the hill, then a sort of network of buildings running right down to the sea. After disembarking they went to Murray Barracks for three days as The King's Regiment had not yet vacated the accommodation. Soon the Battalion was settled in, occupying three barracks and then rotated every six months. HQ and the Officers' Mess were in Murray Barracks. It has been recorded that the floors here were wax polished, a change from the Sudan. One company was split between Wellington Barracks and Victoria Barracks, a Company in Mount Austin Barracks, and, it is believed a third company in Kowloon. Mount Austin was on the Peak which was about 1,500 feet above sea level. Sometimes the Peak disappeared in the clouds for a few days. The more affluent descended to the town in the Peak Tramway. In March 1924 the new Commanding Officer arrived in the person of Lt Col F S Montague-Bates, CB, CMG,DSO who had seen service with the Queen's in the 1914-18 War. The Battalion were sure they would enjoy this posting, with an interesting background and a pleasant climate. Drill clothing was worn in the summer. As well as the Surreys, there was a detachment of gunners and an Indian Army battalion as part of the garrison, and of course the Royal Navy were on the China Station. There was a great deal of activity going on, and as one can imagine a very social existence, with parties galore. 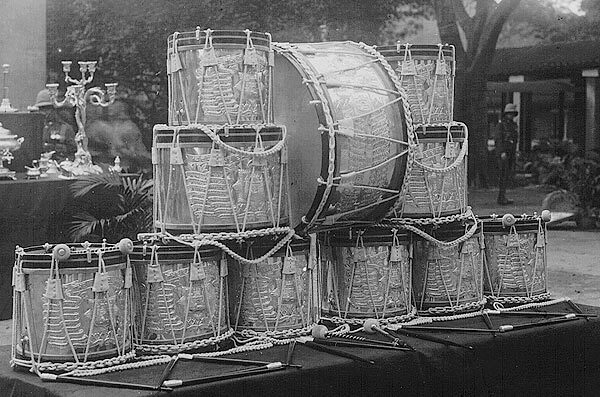 The Band and Drums were in constant demand both for military and civilian occasions. Troopships were played in and out of port. Prince George, later the Duke of Kent, a Naval officer on the China Station, was among the guests that visited the Officers' Mess and played the piano for parties. Girls had a whale of a time with two regiments, the Navy and the civilian population helping to entertain them! Tennis and swimming parties and moonlight picnics on the beach and on launches took place. In those days girls had to have a chaperone, so young marrieds were much sought after to go along and make everything respectable! The Sobraon Ball of 1925 is recorded as having taken place at the City Hall and was organized by the Sergeants' Mess. The Hall was well decorated, the King's Colour, the Regimental Colour and the company flags, together with trophies lent by the officers for the occasion, were displayed at the head of the stairs. Many VIPs attended, and dancing went on from 8 pm until 3 am. The floor was still full when the last waltz was played and then everyone enjoyed a tasty supper of seven courses! It is hoped the next day was a 'rest day'! A certain amount of sport was possible, boxing, hockey, swimming of course and the famous tug o'war teams could try out their strength. There was a garrison tennis league and organized bathing picnics from army launches took place. Wives had the help of Chinese servants, it was not unusual to have the following staff - No 1 Boy, a house coolie, cook and cook's boy, a wash-amah and a gardener; and for those with children, a baby amah! 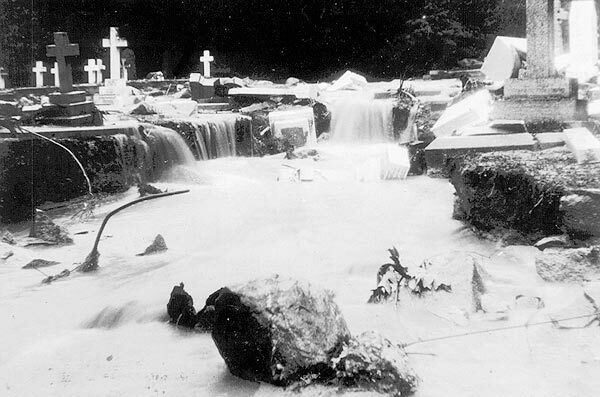 During the Battalion's time on the Island there were three notable high lights, a typhoon, a torrential rain storm and a general strike by the Chinese. The typhoon needed to be experienced to realise the force of the gale. Mount Austin Barracks on the Peak was evacuated. One officer remembers being closeted with most of the officers in the Mess with the slatted shutters closed over all windows. The street in front was deserted except for an unfortunate Chinaman who was caught in the gale and blown to his death along the street like a piece of paper. The storm lasted 24 hours. A wooden penthouse was blown off a naval building. The damage in the harbour was considerable, where literally hundreds of sampans and junks were smashed to matchwood. During the rain storm, six inches fell in less than 24 hours, and although the Officers' Mess was only a few hundred yards from the harbour, the street outside was six feet deep in water. One subaltern who was a bit of a character proceeded to swim down the street to Wellington Barracks clad in his bathing dress and his service cap! 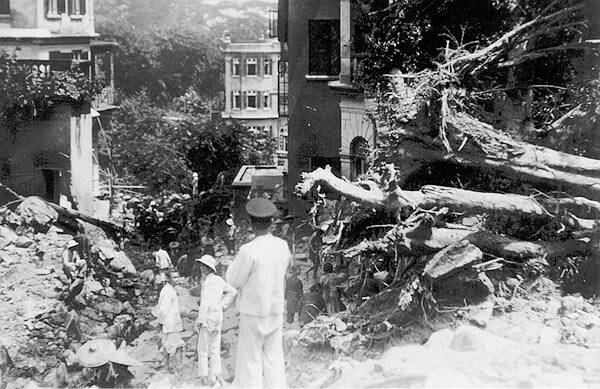 A rock the size of a moderate house slid down from the Peak, sliced a 30 foot avenue through blocks of Chinese houses and splashed into the harbour with the sound of an explosion. The general strike was in 1926. Every Chinaman went on strike, which was organized from China for no apparent reason. The Commanding Officer was besieged by 'taipans' foreign businessmen, to lend them soldiers, but no one could be spared. The Navy took over the more technical duties, such as keeping the power station and water works functioning. The Battalion provided the butchers and bakers and all Army tradesmen reverted to their civilian occupations to try and produce food, not just for the Services but for the British community. The best job was that of keeping the trams running. 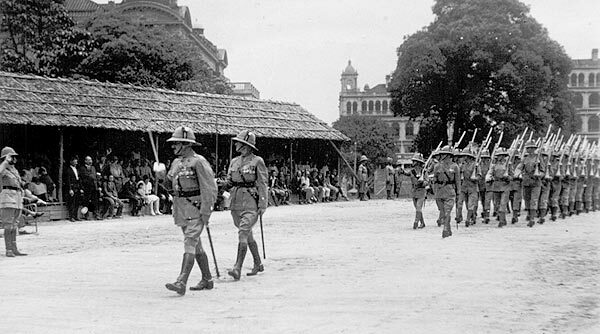 Then guards had to be supplied for all vital points with soldiers assisting the Hong Kong Police. The Chinese held out for about a week and then returned to their occupations as if nothing had happened. A very bad fire broke out in property on the Peak and much good work was done by the Battalion in stopping the fire spreading. The Commanding Officer received high praise from the authorities for the help given by the soldiers. There was plenty of ceremonial in the Colony. The highlight came on Ypres Day (the Regimental Day) 23rd April 1926 when the Battalion was on parade to receive silver drums. The Officers' Mess had received a handsome bequest of £1000 from the late Mrs Walker, in memory of her son, an officer in the Battalion who had died of enteric fever in India in 1894. With this money the officers purchased these beautiful drums. The Battalion was formed up on the parade ground in Murray Barracks. The General Officer Commanding was received with a General Salute. The Governor of the Colony then arrived, and, as the King's representative was received with the Royal Salute. The Battalion was inspected, the old drums were trooped and the new silver drums blessed by the Bishop of Hong Kong. The Commanding Officer addressed the Battalion regarding the bequest, and said the drums would be kept in the Officers' Mess and would be used for ceremonial occasions. He also mentioned Hill 60 where three members of the Battalion were awarded the Victoria Cross and where 15 officers, including the Commanding Officer, and 264 soldiers were killed. After the GOC's wife had presented the silver drums to the Battalion, the GOC presented the Sergeant Drummer with his Long Service and Good Conduct Medal. The Battalion then marched off in column of route. A motion picture of this parade has been found at the Museum at Clandon, and a video is now being made for showing in future. During the afternoon the silver drums and silver from the Officers' and Sergeants' Messes were displayed in Murray Barracks. These lovely drums are now in the care The Princess of Wales's Royal Regiment. That evening the Sergeants held a regimental ball which was attended by His Excellency the Governor, the GOC and the Commanding Officer, accompanied by their wives. It is reported that they danced a set of Lancers and "enjoyed it immensely". The last waltz was played at 2 am. It had been quite a day for the Battalion and especially CQMS Prosser, MM, the President of the Sergeants' Mess entertainment committee, who had arranged this superb regimental occasion. Life had its serious side, and soldiering did take place. Training was vigorous and the Battalion made some memorable marches in the hilly and difficult country behind Kowloon. Twice the Battalion had six weeks of strenuous training on the mainland at Lo Wu in the New Territories. All good things have to come to an end and the soldiers felt a certain amount of regret that the Battalion's days in China were coming to an end. Their last two months were hectic, inspections, Trooping the Colour, dinner parties, and many 'At Homes'. There were two famous regimental personalities serving with the Battalion. The first was CSM C M Estall, MC., of C Company. He had won the Military Cross during the 1914-18 War as a Warrant Officer. His medals and sword are held in the Museum at Clandon. Later in the thirties he was the Garrison Sergeant Major in Hong Kong. The second was RSM W G Gingell, MBE MM who was commissioned in 1932 and who was to prove an outstanding Quartermaster in Malaya with the 2nd Battalion. On embarkation day the Battalion marched to the ship with bands playing, bayonets fixed and Colours flying. The population turned out to wish them God speed, and Prince George visited the Battalion to say farewell. HMT Neuralia, with the regimental flag at the masthead steamed slowly out to sea, saluted by all ships in the harbour, and played out by bands, including the Battalion's on the stern, with the strains of Auld Lang Syne drifting across the water. A very moving farewell! Next stop Karachi for Rawalpindi, and another chapter began to unfold in the history of the 1st Battalion The East Surrey Regiment.